Buy Fingerprint Time Attendance system and Fingerprint Access control system for Offices. Fingerprint Scanners and Fingerprint Readers with Software Development Kits (SDKs) for Computer security and UID Aadhaar project. Source Biometrics Security systems, Fingerprint Recognition, Face recognition and Iris Recognition technology products and services. 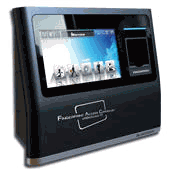 Biometric Time Attendance machine and Biometric Access control systems and software. Now start developing biometric fingerprint based applications using SDK. 60 days full featured evaluation version of SDK is available on CD or download it from url given below. Deploying these biometrics technologies can be used separately or together in one powerful package to meet your entire authentication, verification and identification needs. Our proven technologies allow customers to develop highly scalable biometrics security solutions. Our FBI certified award winning biometrics devices and fingerprints scanners have rugged design and an unmatched fingerprint capturing capability. Our fingerprint readers are ideal for government innovativeness and enterprise applications. India, Fingerprint Time Attendance system in India, UAE (Dubai), Bahrain, Oman, Saudi Arabia, Qatar, Africa – Kenya, Nigeria, South Africa, Uganda. - Biometric Access Control system in India, Costa Rica, Croatia, Czech Republic, Cuba, Cyprus, Iran, Iraq, Ireland, Israel. Biometrics security systems in Malaysia, Maldives. Fingerprint Scanner and Fingerprint Reader in Algeria, Morocco, Bahrain, Egypt, , Israel, Jordan, Kuwait, Turkey, United Arab Emirates, Lebanon, Iran, Iraq Libya, Oman, Palestine, Sudan, Syria, Qatar, Saudi Arabia, Tunisia, Yemen - Fingerprint Access control in South Africa, Egypt, Nigeria, Algeria, Morocco, Angola, Sudan, Tunisia, Libya, Ethiopia, Kenya (Fingerprint Time Attendance Software, Fingerprint Software Kits and Biometric Consultancy Services) -Biometrics Services in North America – USA, Canada and Mexico along with solutions in Europe – United Kingdom (UK), Spain, France, Germany, Italy, Belgium – Netherland – Luxemburg, Poland, portugal -Biometrics Kiosks and ATMs in Russia, Ukraine, China, Korea, Japan, Thailand, Malaysia, Singapore Fingerprint time attendance system in Jaipur, New Delhi, Vadodara, Nagercoil, Durgapur, Alleppey, Baroda (Access control), Lucknow, Ernakulam, Nasik, Pune, Erode, Tiruchirapalli. Time attendance software in Salem, Secunderabad, Mumbai (ex Bombay), Panjim, Nagpur, Delhi (Fingerprint time attendance), Coimbatore, Kochi Patna (Fingerprint recognition systems), Amritsar, Kolkata (ex Calcutta). Biometric access control system in Ludhiana, Bhubaneswar, Navi Mumbai, Jalandhar, Guwahati, Madurai, Kozhikode (ex Calicut), Siliguri Guntur, Surat, Fingerprint systems in Cochin, Bangalore (Biometrics and Fingerprint). Fingerprint Scanner in Zirakpur, Palghat, Thiruvananthapuram (ex Trivandrum), Ahmedabad, Hyderabad (Biometrics security systems and Biometric time attendance). - Fingerprint Reader in Pondicherry, Raipur, Indore , Rajkot, Visakhapatnam, Thane, Mangalore, Kanpur (Time attendance), Chennai (ex Madras).